Summary: This portion of the Nitric Oxide series on PharmaceuticalIntelligence(wordpress.com) is the first of a two part treatment of platelets, the coagulation cascade, and protein-membrane interactions with low flow states, local and systemic inflammatory disease, and hematologic disorders. It is highly complex as the lines separating intrinsic and extrinsic pathways become blurred as a result of endothelial shear stress, distinctly different than penetrating or traumatic injury. In addition, other factors that come into play are also considered. The 2nd piece will be concerned with oxidative stress and the diverse effects on NO on the vasoactive endothelium, on platelet endothelial interaction, and changes in blood viscosity. 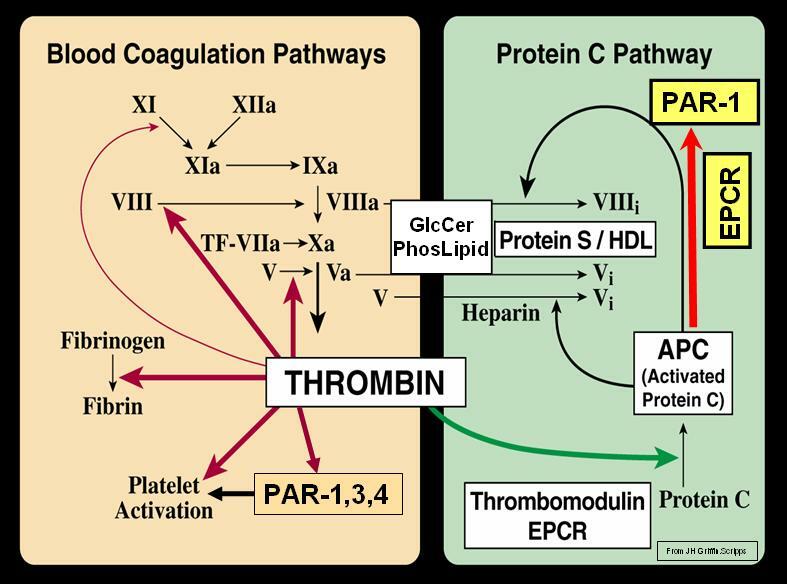 The workhorse tests of the modern coagulation laboratory, the prothrombin time (PT) and the activated partial thromboplastin time (aPTT), are the basis for the published extrinsic and intrinsic coagulation pathways. This is, however, a much simpler model than one encounters delving into the mechanism and interactions involved in hemostasis and thrombosis, or in hemorrhagic disorders. prothrombin, mainly responsible for the distinction between plasma and serum (defibrinated plasma). A tetrapeptide, residues 6 to 9 in normal prothrombin, was isolated from the NH(2)-terminal, Ca(2+)-binding part of normal prothrombin. The peptide contained two residues of modified glutamic acid, gamma-carboxyglutamic acid. This amino acid gives normal prothrombin the Ca(2+)-binding ability that is necessary for its activation. I have identified the importance of prothrombin, thrombin, and the divalent cation Ca 2+ (1% of the total body pool), mention of heparin action, and of vitamin K (inhibited by warfarin). Endothelial functions are inherently related to procoagulation and anticoagulation. The subendothelial matrix is a complex of many materials, most important related to coagulation being collagen and von Willebrand factor. What about extrinsic and intrinsic pathways? Tissue factor, when bound to factor VIIa, is the major activator of the extrinsic pathway of coagulation. Classically, tissue factor is not present in the plasma but only presented on cell surfaces at a wound site, which is “extrinsic” to the circulation. Or is it that simple? acts as the intercellular glue binding platelets to one another and also to the subendothelial matrix at an injury site. acts as a carrier protein for factor VIII (antihemophilic factor). mediates platelet adhesion to the vascular wall under shear. [Lefkowitz JB. Coagulation Pathway and Physiology. Chapter I. in Hemostasis Physiology. In ( ??? ), pp1-12]. activates small amounts of thrombin. Tissue factor/factor VIIa is also capable of indirectly activating factor X through the activation of factor IX to factor IXa. Finally, as more thrombin is created, it activates factor XI to factor XIa, thereby enhancing the ability to ultimately make more thrombin. Activation of the intrinsic pathway is promoted by non-biological surfaces, such as glass in a test tube, and is probably not of physiological importance, at least not in coagulation induced by trauma. Instead, the physiological activation of coagulation is mediated exclusively via the extrinsic pathway, also known as the tissue factor pathway. Tissue factor (TF) is a membrane protein which is normally found in tissues. TF forms a procoagulant complex with factor VII, which activates factor IX and factor X.
which ultimately merge at the level of Factor Xa (common pathway). Regulation of thrombin generation. Coagulation is triggered (initiation) by circulating trace amounts of fVIIa and locally exposed tissue factor (TF). Subsequent formations of fXa and thrombin are regulated by a tissue factor pathway inhibitor (TFPI) and antithrombin (AT). When the threshold level of thrombin is exceeded, thrombin activates platelets, fV, fVIII, and fXI to augment its own generation (propagation). 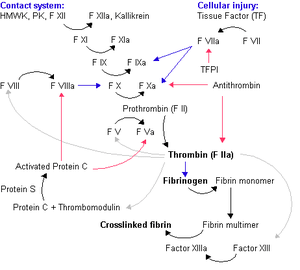 Activated factors IX and X (IXa and Xa) will activate prothrombin to thrombin and finally the formation of fibrin. Several of these reactions are much more efficient in the presence of phospholipids and protein cofactors factors V and VIII, which thrombin activates to Va and VIIIa by positive feedback reactions. We depict the plasma coagulation emphasizing the importance of membrane surfaces for the coagulation processes. Coagulation is initiated when tissue factor (TF), an integral membrane protein, is exposed to plasma. TF is expressed on subendothelial cells (e.g. smooth muscle cells and fibroblasts), which are exposed after endothelium damage. Activated monocytes are also capable of exposing TF. A small amount, approximately 1%, of activated factor VII (VIIa) is present in circulating blood and binds to TF. Free factor VIIa has poor enzymatic activity and the initiation is limited by the availability of its cofactor TF. The first steps in the formation of a blood clot is the specific activation of factor IX and X by the TF-VIIa complex. (Initiation of coagulation: Factor VIIa binds to tissue factor and activates factors IX and X). Coagulation is propagated by procoagulant enzymatic complexes that assemble on the negatively charged membrane surfaces of activated platelets. (Propagation of coagulation: Activation of factor X and prothrombin). Once thrombin has been formed it will activate the procofactors, factor V and factor VIII, and these will then assemble in enzyme complexes. Factor IXa forms the tenase complex together with its cofactor factor VIIIa, and factor Xa is the enzymatic component of the prothrombinase complex with factor Va as cofactor. Activation of protein C takes place on the surface of intact endothelial cells. When thrombin (IIa) reaches intact endothelium it binds with high affinity to a specific receptor called thrombomodulin. This shifts the specific activity of thrombin from being a procoagulant enzyme to an anticoagulant enzyme that activates protein C to activated protein C (APC). The localization of protein C to the thrombin-thrombomodulin complex can be enhanced by the endothelial protein C receptor (EPCR), which is a transmembrane protein with high affinity for protein C. Activated protein C (APC) binds to procoagulant surfaces such as the membrane of activated platelets where it finds and degrades the procoagulant cofactors Va and VIIIa, thereby shutting down the plasma coagulation. Protein S (PS) is an important nonenzymatic cofactor to APC in these reactions. (Degradation of factors Va and VIIIa). The common theme in activation and regulation of plasma coagulation is the reduction in dimensionality. Most reactions take place in a 2D world that will increase the efficiency of the reactions dramatically. The localization and timing of the coagulation processes are also dependent on the formation of protein complexes on the surface of membranes. The coagulation processes can also be controlled by certain drugs that destroy the membrane binding ability of some coagulation proteins – these proteins will be lost in the 3D world and not able to form procoagulant complexes on surfaces. It can be divided into the phases of initiation, amplification and propagation. In the initiation phase, small amounts of thrombin can be formed after exposure of tissue factor to blood. In the amplification phase, the traces of thrombin will be inactivated or used for amplification of the coagulation process. At this stage there is not enough thrombin to form insoluble fibrin. In order to proceed further thrombin activates platelets, which provide a procoagulant surface for the coagulation factors. Thrombin will also activate the vital cofactors V and VIII that will assemble on the surface of activated platelets. Thrombin can also activate factor XI, which is important in a feedback mechanism. In the final step, the propagation phase, the highly efficient tenase and prothrombinase complexes have been assembled on the membrane surface. This yields large amounts of thrombin at the site of injury that can cleave fibrinogen to insoluble fibrin. Factor XI activation by thrombin then activates factor IX, which leads to the formation of more tenase complexes. This ensures enough thrombin is formed, despite regulation of the initiating TF-FVIIa complex, thus ensuring formation of a stable fibrin clot. Factor XIII stabilizes the fibrin clot through crosslinking when activated by thrombin. Fibrinolysis is the physiological breakdown of fibrin to limit and resolve blood clots. Fibrin is degraded primarily by the serine protease, plasmin, which circulates as plasminogen. In an auto-regulatory manner, fibrin serves as both the co-factor for the activation of plasminogen and the substrate for plasmin. In the presence of fibrin, tissue plasminogen activator (tPA) cleaves plasminogen producing plasmin, which proteolyzes the fibrin. This reaction produces the protein fragment D-dimer, which is a useful marker of fibrinolysis, and a marker of thrombin activity because fibrin is cleaved from fibrinogen to fibrin. Cardiac surgery with concomitant CPB can profoundly alter haemostasis, predisposing patients to major haemorrhagic complications and possibly early bypass conduit-related thrombotic events as well. Five to seven percent of patients lose more than 2 litres of blood within the first 24 hours after surgery, between 1% and 5% require re-operation for bleeding. Re-operation for bleeding increases hospital mortality 3 to 4 fold, substantially increases post-operative hospital stay and has a sizeable effect on health care costs. Nevertheless, re-exploration is a strong risk factor associated with increased operative mortality and morbidity, including sepsis, renal failure, respiratory failure and arrhythmias. Loved it!!! Thank you for this great post…….It was great reading it. Larry is a very gifted writer, I commissioned him to write on NO and Renal and he had created a post which I requested him to break into FOUR and create the fifth as the highlights of the research results for the entire series. It let me to initiate and Larry to author a new post on Blood viscosity, Triglycerites and CVD, forthcoming. I had to convince Larry to do it after I provided him with all the resources I wish being reviewed and included. Lots of work behind the scene.